Kickstarter Alert: TMNT Legend Jim Lawson Talks 'The Box City Wallops' – AiPT! Longtime Teenage Mutant Ninja Turtles fans are no doubt familiar with the work of writer and artist Jim Lawson. Penciling the original series’ “Return to New York” storyline and creating the Rat King are among his many contributions to TMNT lore. 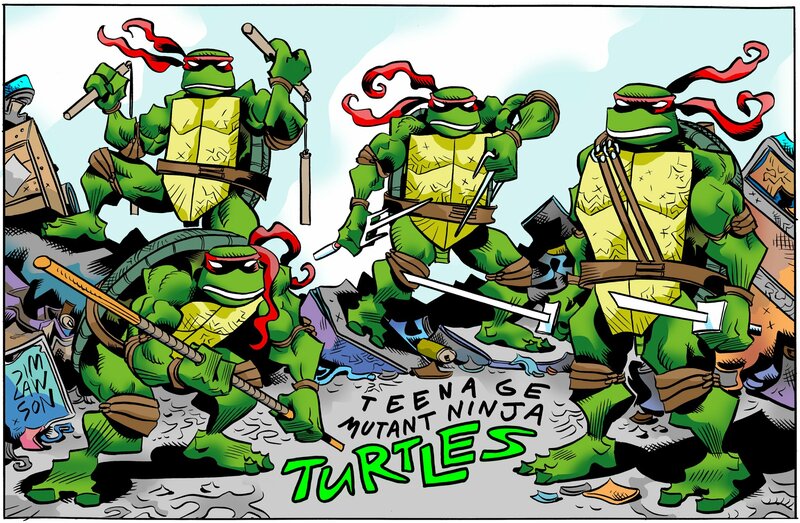 Beyond the Turtles, Lawson, who recently appeared at New England Super Megafest Comic-Con in Massachusetts, creates his own comics and funds them via Kickstarter. His current series, The Box City Wallops, will get another two issues if funded by May 18. After chatting briefly at Megafest, AiPT! connected with Lawson for a more in-depth discussion of his work. AiPT! : How did you get started in comics? What is your origin story? AiPT! : Oh, that’s where the idea for the Turtles came from! Lawson: You know, honestly, I’ve been drawing ever since I was a little kid. I’ve always been artistically inclined. And so I always knew I wanted to do something with art. I was kind of a mad drawer, so going to art school was kind of predetermined for me. So when I graduated high school, I drifted around a little bit, and then I ended up at art school down in Hamden, CT., which is just above New Haven. The name of the art school was Paier College of Art. I went there and got an illustration degree, and at first I thought I was going to be an illustrator. I can remember Brad Holland, he was a big illustrator at the time, he was kind of my hero. He did these very painterly, cartoony images, and I thought they were really cool. And I had been into comics when I was younger. But not really, you know, crazy about it. I wasn’t collecting books or anything like that, I just loved the stories and art. I kind of “grew out of it” I guess, or drew away from it. And then when I was at Paier, I met this dude, and he was doing comics, and it was like a little light went of in my brain. It was a reminder to myself of how cool comics were, and that drew me back in. And then I left art school and very fortunately through weird circumstance got an introduction to Kevin [Eastman] and Peter [Laird], just these guys that were doing this comic at the time. It was pretty early for them; however, they were having crazy success. I want to say it was around issue five, but I’m not certain, four or five. So I took my portfolio over there, and they looked at it, and at the time they had another guy, Tony Basilicato, approach them to do like a backup story, something called Prime Slime Tales, and they asked me if I wanted to start inking that – which I did – and from then on, with Mirage Studios, the rest is history, I’ve just always been with them. AiPT! : I’d say that’s a great origin story. And now you’re creating your own comics, that’s really cool. Lawson: Yeah, I can’t seem to break away from it. AiPT! : When did you start writing your own stories? Lawson: I remember I did a pinup for the Turtles way way back. Honestly, I can’t remember what my first; I guess it might have been with Tales [of the Teenage Mutant Ninja Turtles]. Ryan [Brown] and I were up here in Northampton living together, and the Turtles were doing great, and they decided to do a non-Peter and Kevin off-shoot of the Turtles, kind of little one-shot issues. And actually, in the beginning of Tales of the Teenage Mutant Ninja Turtles, Ryan and I traded off issues, so that probably was my first, or one of the earliest, of my writing gigs. And that probably was the story where the Rat King character got introduced. So that was probably at the first Tales series. AiPT! : And you have done your own stories since then, such as The Box City Wallops on Kickstarter. Was it after the Turtles you started having other ideas, or were these ideas always in the back of your head, but you didn’t have time until after the Turtles quieted down? Lawson: I know during a period when the Turtles weren’t being published by Mirage, when Image took over the Turtles, Peter and I got together on this story called Planet Racers. And I remember I did a two-issue series for Antarctic Press called Guzzi LeMans. It’s always been something I wanted to do – I like sitting around thinking about new ideas. I think it has been something always there. But now, of course, since the Turtles sold, I have nothing but time to come up with these ideas. I did a book called Dragonfly, and then the Box City Wallops, and a kids book Dinosaur Head Cat. That was a lot of fun. AiPT! : Since you have the Kickstarter up for the next two issues of The Box City Wallops, do you want to give a synopsis for people who haven’t read it? Lawson: I seem to have these archetypal characters that I keep coming back to – the big muscular dude, the tough chick, and the little alien guy. These guys seem to haunt my works, and so very similar characters appeared in Dragonfly, for example. So here they are again, in a new environment, a new story. So I’ve got these three guys, and it’s a superhero book, and I’ve never really done a superhero book, although people have asked me if I consider the Turtles a superhero book. I have to scratch my chin a little bit and say, “well maybe.” But these three are super heroes, and they are aliens, and they are also siblings. They work for Box City. What I’ve set up is that cities have their own superhero teams. It’s not like New York City in the Marvel Universe where there is a multitude of superheroes flying around, each doing their own thing. These guys are the superheroes for Box City, they work for compensation, they have a contract, they help promote the city and themselves. I guess you could say along the lines of what a sports team might do. In the first few issues I set up that they are secretly trying to get the job for a neighboring city, called Miracle City, who maybe wants to get rid of their team (the Miracle City Killocrats). So the Wallops have applied for this other job. In the meantime they are trying to keep that a secret and pretend that everything is fine with them in Box City. However, the Miracle City team is headed by this crazy guy, Mos Eiko. He knows about their desire to replace him, and he is trying to sabotage them. So there’s this weird little dynamic where there is stuff going on in the background and a little bit of drama besides the action that a normal superhero team would have to contend with. My style is kind of goofy, and it’s supposed to be fun, and yet I don’t have this deep deep storyline; I’m trying to keep things light and a little bit fun. AiPT! : It is a really fun read, I’m looking forward to the next one! So if they move to Miracle City, are you going to have to change the name of the book? Will the next chapter be The Miracle City Wallops? Lawson: You know, I haven’t quite thought about that yet. I guess we’ll have to see after issue six what will happen. AiPT! : What’s been your favorite part of the process of making creator-owned comics and using Kickstarter? Lawson: I love drawing, I live to draw. I’ve developed a deep love of creating an idea, or a world, doing the writing, and coming up with a great story. I love telling stories. I love the whole process of it, and coming up with plots and subplots and tying things together, and how you show something on page four will somehow come back to mean something on page 61. I just think that is the greatest, and when you’re done writing a story, and you’ve given birth to an idea, it’s like so elevating, I love it. Also, the practical drawing, I love drawing. I can’t seem to stop, damnit. I love everything about the whole creative process. The part I don’t like is the whole business part. I am not a self-promoter. I hate having to sit down and try and think of ways as to how I can get eyes on what I’m trying to to do and get people wanting to get enthusiastic about my project, which means money. The way I have it set up now going through Kickstarter, I need supporters to get the books made, and it’s tough. AiPT! : But you have always been successful with funding your other Kickstarters. You definitely have a devoted fanbase. Lawson: Yeah, I have a core of people that are really terrific, and I’m really grateful for that. I really like the level I’m at. I’m a little bit well known, I guess, but not crazy well known. It’s nice, there is a kind of an intimacy that comes along with me and the little group of people who follow me. AiPT! : Yeah, I feel like there is a camaraderie, you’re really good to your fans. So, do you like doing the creator-owned work better than working for a larger company like Mirage, or is it easier when someone else is in charge of all the business stuff? Lawson: You know, it is easier when someone takes care of all that. For years and years, I was spoiled by the whole Mirage experience. I could go to my little room, and if I chose to, I could just close the door and not see another living soul all day long, and I could just draw, and that’s all I would have to worry about is drawing. I loved working on the Turtles, I loved the characters and thought I knew them very well, and there was kind of a family feeling between the Turtles and me. All that being said, it is great to have your own thing going. I wish I was making the money like in the Mirage days. But there is something beyond money that is rewarding with working on your own thing, and seeing it come to life. It is a little bit of a balancing thing, choosing this life of being a freelance artist. But like I said, there is a value to this that goes beyond what is in my bank account. AiPT! : What comics did you read as a kid? Lawson: You and I have this in common, I was a big Archie comics guy. So I read a lot of Archie, and I was a big Spider-Man guy. Swamp-Thing, I used to love that, Man-Thing … I was all about the artist, I loved good art. What else would I buy? Tomb of Dracula, Ghost Rider, Werewolf by Night, Creepy magazine. And CARtoons Magazine, back in the day, I would buy that. It’s kind of funny, because CARtoons has come back after maybe a 30-, 40-year absence, and I’m actually submitting stuff to them again. AiPT! : If you could draw for any comic book property, and you could do anything you wanted, what would you do? Lawson: After talking about Man-Thing, no one has done anything with Man-Thing, right? AiPT! : Not enough, I feel like Man-Thing is very under-represented. Swamp-Thing has gotten a bit more love lately, but Man-Thing is still skulking around in the background of comics. The poor guy, I feel bad for him. Lawson: I’ll say Man-Thing, because I think he needs a light shined on him. AiPT! : You’d draw such a great Man-Thing, I think it would be amazing. I hope Marvel sees this. Lawson: He’s so cool. And just saying you draw Man-Thing, that sounds really badass, too. He would just need some kind of badass chick on the team, and a little alien guy. AiPT! : Then your golden trio of characters is preserved! Jim’s Kickstarter runs through May 18 and is close to full funding, check out his new Kickstarter for The Box City Wallops here. You can also follow him on Facebook or on his website.